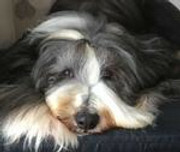 It has been suggested that anyone going to Crufts, should, if they wish wear something Violet in memory of Jill Smith. I will see what I have/can get. May get a badge with Cornish Violets onif I can find one.